The Paulova is one of my favorite desserts! So much so that this year for Christmas I will prepare a roulade of meringue filled with whipped cream and with this delicious compote of red berries that today I will teach you to do. Today’s is exquisite and very Christmas. I hope you like it. Preheat the oven to 110 º C.
Whisk the egg whites in the cooking robot with a few drops of white wine vinegar. Gradually add sugar mixed with cornstarch and vanilla fruit. We must get some very bright and very well-assembled whites. Insert the set into a pastry sleeve with smooth nozzle and wide mouth. Bowl 8 circles in the shape of a crown and with a hollow in the center on a baking tray lined with baking paper. Oven for 1 hour. Turn off the oven and leave the meringue another hour in the oven off. Meanwhile prepare the red fruit compote. Put the frozen red fruits, orange juice, sugar and a pinch of cloves to the fire. Leave for 15 minutes on medium heat, stirring occasionally. We must get a red fruit compote but do not completely undone the fruits and reduce the juice. After 15 minutes add the cornstarch that we have dissolved in a little cold water. Mix in the fire, let it boil for a minute and set aside. Let it cool down. Mount the cream with the sugar and vanilla extract and place in a pastry sleeve. When assembling the Paulova, fill each dry meringue with the whipped cream. 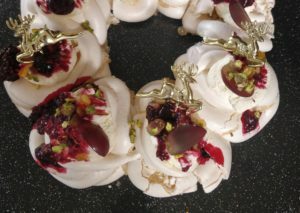 On each meringue, have 1 tablespoon of the delicious red fruit compote, finish by adding the chopped candied fruit and the chopped pistachios.